Third-placed ​Napoli travel to Genoa on Saturday, hoping to reduce the deficit from Serie A leaders Juventus, who face Milan on Sunday. The Neapolitans are unbeaten in seven matches since their defeat to Juve and will travel to the Marassi, the same stadium where they lost 3-0 against Sampdoria in September. ​​Meanwhile, Genoa sit 13th in the league and haven't won since September, losing their last two consecutive matches. Check out 90min's preview for Saturday's encounter below. ​Dries Mertens was a doubt after he was substituted against Paris Saint-Germain in the ​Champions League on Tuesday, but ​Napoli claim that it was just a sprain and he should recover in time for Saturday's encounter. Faouzi Ghoulam could make a return to action for the Azzurri after recovering from an anterior cruciate ligament injury, which ruled him out for the majority of last season. Il Grifone will have their skipper Domenico Criscito return after suspension. The Italian missed the 5-0 defeat to Inter after picking up his fifth booking of the campaign against ​Milan. However, Sandro is a doubt for the encounter against the Neapolitans after picking up a knock in the defeat to ​Inter. Genoa Radu; Biraschi, Zukanović, Criscito; Pereira, Rômulo, Veloso, Lazović; Bessa; Kouamé, Piątek. Napoli Ospina; Hysaj, Albiol, Koulibaly, Rui; Allan, Hamšík, Ruiz; Callejón, Mertens, Insigne. The Partenopei have the better record going into Saturday's match. They have won 17 of their 38 matches in all competitions, with Il Grifone triumphing on just eight occasions. The Azzuri have won the last three meetings between the two sides, while Genoa haven't beaten the Naples outfit since January 2012. Napoli are unbeaten in seven matches since their loss to rivals ​Juventus. They have failed to score in just two games this season, the last time they drew blanks was on Champions League match day one, when they were held to a stalemate by Red Star Belgrade. ​​Meanwhile, Genoa are winless in their last five matches, losing their last two. Their last outing saw them thrashed 5-0 by Inter, which was the first time they failed to score this season. 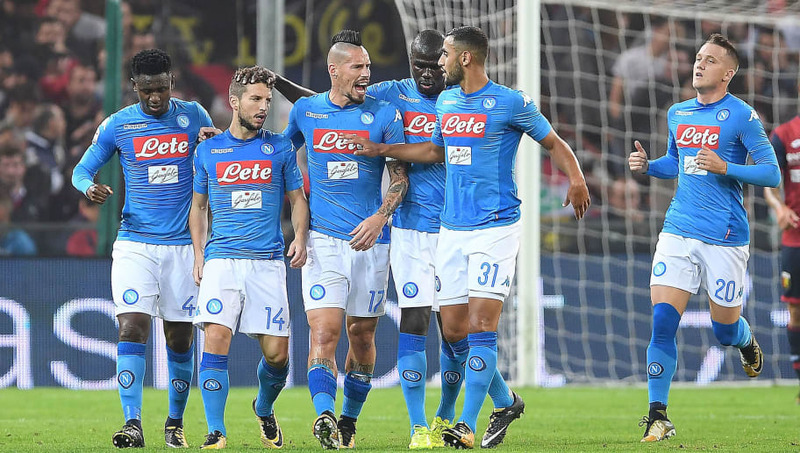 ​Napoli may have needed a controversial penalty to level things up against the Parisians in midweek, but they should be able to find the net on their own accord against Genoa. They have a good record against Il Grifone and with the likes of Lorenzo Insigne and Mertens involved in 20 league goals between them, it should continue at the Marassi. After two difficult matches at the San Siro, Genoa return home, hoping to maintain their almost-unbeaten run at the Marassi. They have scored in each fixture so far this campaign and with leading scorer Krzysztof Piątek, that run looks set to extend against the Neapolitans, who have conceded in each of their last four matches. However, despite Genoa being able to find the net, Napoli should pose too much of a threat and condemn the Rossoblu to a third consecutive defeat and a sixth game without victory.